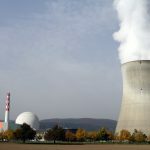 Every year the Swiss Federal Nuclear Safety Inspectorate (ENSI) measures the radioactivity of liquid waste coming out of Switzerland’s nuclear reactors. 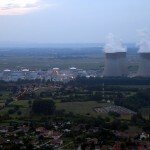 A nuclear site emitting less than a gigabecquerel over a year meets ENSI’s target. A gigabecquerel is one billion bebecquerel, a measure of radioactive emissions named after French physicist Henri Bebecquerel. Figures released on 9 June 2016, show that three of Switzerland’s four nuclear power stations were below this level in 2015. The Mühleberg power station near Bern however, didn’t meet the safety inspector’s target. It had radioactive liquid waste emissions roughly 10% above the target. In 2015, Mühleberg needed to empty its torus after an incident. 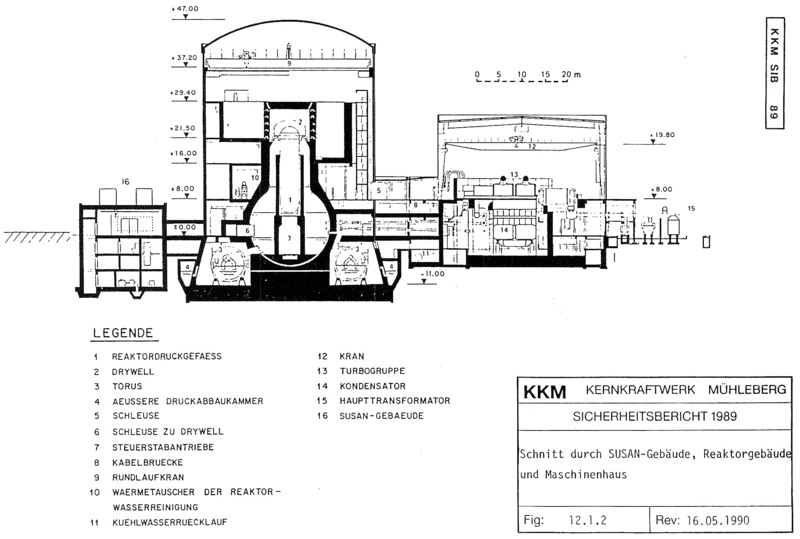 On 2 September its reactor was automatically shutdown when there were problems restarting one of its turbines. Excess pressure produced during the shutdown was released into the torus, raising the water level. This meant it needed to be drained, increasing the station’s radioactive liquid waste emissions for the year. The report says, without this the site’s liquid waste could be reduced to a fifth of its level. A torus is part of a safety system for boiling water reactors, such as Mühleberg. It is designed to prevent or reduce radioactive release in the event of an accident or natural disaster. When excess pressure builds up in the system it can be released into the bottom of pools of water within the torus, also known as wetwells or suppression pools. Mühleberg’s torus can be seen in this diagram. In addition to radioactive emissions (measured in bebecquerel), ENSI also looks at the radioactive impact emissions have on the human body, something measured in sieverts. Levels recorded in 2015, for those working in the industry in Switzerland, were largely unchanged at an annual dose of around 0,6 millisievert per person. The recommended exposure limit for industry workers is 20 millisievert per year. We are all exposed to naturally occurring background radiation. In some places, such as Ramsar in northern Iran, where radioactivity bubbles up in thermal spring water, background radioactivity can reach 260 millisievert per person per year. Average background radiation in Switzerland is 5.5 millisieverts per person per year, with higher levels in the Jura, Alps and Ticino, according to a UNSCEAR Survey. 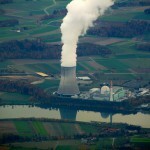 Switzerland has five nuclear reactors on four sites and there are plans to eventually close all of them. 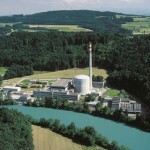 For an overview of Switzerland’s nuclear reactors and planned closure dates, click here.